This is a 1985 25 ft MacGregor swing-keel sailboat with trailer. 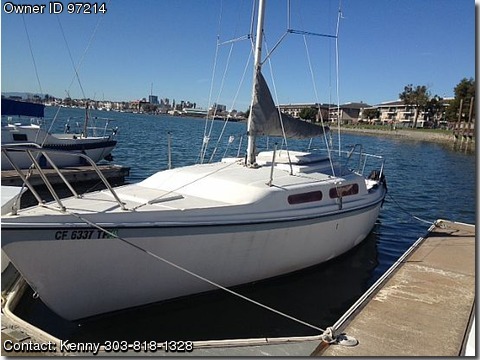 This boat is in overall good and sailable condition. It is currently out of the water and on the trailer. The boat has a lot of new parts and was recently painted and everything works good. It comes with mainsail, jib and genoa which are all decent but the mainsail could use a sew job on one corner. There is a small private head (toilet) and kitchenette with sink. The mast lays down and the keel swings up for trailering and the boat is easy to get on an off the trailer and fairly light at about 2,500 lbs so can be towed with smaller vehicles. This is a great boat for the bay or lake sailing and a great boat for learning on! As always with a vehicle this age, it may need some additional work and TLC! Will deliver within 60 miles for FREE!! • Replaced rear stay and side shrouds a few years back. • Trailer is in decent condition with newish tires and spare and new waterproof lights. There is some rust on the trailer.